As an Admin you can customize your team's pipelines and sales stages under Settings > Sales Stages. Create multiple pipelines if your business requires you to manage different processes with different sets of sales stages. There will always be a default pipeline which you will use if you only require one set of sales stages. Examples of when multiple pipelines are needed: sale of different products or managing new versus recurring revenue. Once your pipelines are set up you can edit the sales stages for each pipeline. Choose the pipeline from the drop-down list under Sales Stages. If you do not have multiple pipelines you will see the default pipeline sales stages and be able to make edits. To add a new sales stage, click the + sign. Be sure to choose if each stage should be Open (an opportunity that is being actively worked on), Won (you successfully closed the deal) or Lost (the deal fell through). Hover over an existing sales stage to edit or delete. To reorder sales stages, you can drag and drop so the stages are in the correct order. IMPORTANT: If you change an existing sales stage, opportunities with the prior sales stage will not automatically update to the new stage. 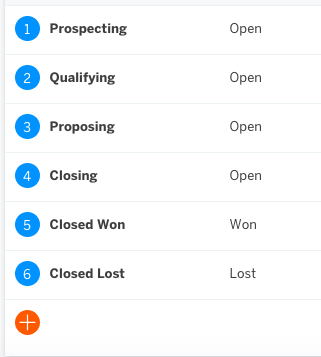 You will be able to manually update these values to the new stage by finding the opportunities using the Open, Won or Lost filter on the Opportunity page.